". . . despite the outsized role of California and Los Angeles in modern United States history, the West Coast has gotten relatively short shrift in the works of serious historians. Enter City of Promise . . . which provide[s] a rich exploration of Los Angeles' racialized past. . . Kenneth C. Burt expands [the] exploration of Mexican-Americans by looking into Latino politics." "In the final chapter on postwar Latino LA, Kenneth Burt begins with the formation of the Community Services Organization (CSO) by Fred Ross, Edward Roybal, and Saul Alinsky to increase Mexican American votes for Democrats in the late 1940s. CSO's efforts led to Roybal's election in 1949 to the LA city council, where he addressed issues of fair employment and police brutality. Despite the Latino population's growth, low voter participation continued. Latino political leaders in the 1980s created 'majority' Latino districts in LA to ensure the election of Latino candidates. But the greatest motivation for Latino political participation was the anti-immigrant Proposition 187 that denied undocumented immigrants essential social services and Proposition 209 that ended affirmative action. The rise of a coalition of Latinos and labor groups helped elect Latinos in the 1990s, culminating with Antonio Villaraigosa's election as mayor in 2005." "Kenneth C. Burt's essay examines shifts in Latino political strategies from shortly after World War II through the early twenty-first century. Most interestingly, and most importantly for contemporary activists seeking to bridge ethno-racial community divides, Burt argues that Los Angeles Latinos made some of their biggest political strides when they built coalitions with multiethnic groups, labor, and religious institutions. He illustrates his argument by examining coalitional efforts during two periods more than a half-century apart: initiatives by the Community Service Organization (CSO) in the late 1940s and early 1950s, and the mayoral election of Antonio Villaraigosa in 2005." "Kenneth C. Burt concludes the book with an impressively researched and compellingly argued account of Mexican American politicalication after the war. Response to the Zoot Suit Riots in 1943 and to Proposition 187 in 1994 led to large-scale political activism, coalition formation, and periods of positive social programs. Testing this pattern, he finds that the rise of a Latino machine and a Latino-business alliance from the 1970s through the 1990s, while successful at winning offices, failed to serve or win the allegiance of Latino voters. The post-187 activism and the current Latino-labor alliance that Burt celebrates will inevitably morph again when Latinos become the voting majority in Los Angeles." "The highlights of this book are Josh Side's well-written chapter on changes in the black community propelled by World War II and demographic and economic shifts since the 1960s and Kenneth Burt's insightful essay on Latino grassroots and electoral politics, which connects mobilizations in the 1990s and 2000s with their counterparts in the 1940s. Importantly… Burt's is the only chapter to deal substantively with relationships between the city's minority groups." "Kenneth Burt narrates the development of political organization and power following the war. From Edward Roybal to Antonio Villaraigosa, he offers a detailed narrative of a growing population gaining first through coalitions with other ethnic groups and later via a Latino labor organization. Unfortunately, little space remains for immigration and socioeconomic issues." "The ultimate chapter in the book is by Ken Burt. Burt traces the history of formal Latino politics in Los Angeles from the election of Ed Roybal to the City Council in 1949 to the 2005 mayor election of Antonio Villaraigosa. He finds that strategies of political empowerment employed by Latinos in the 1940s are remarkably similar to those of the late 1990s to the present. Utilizing the voter registration drives of the Community Services Organization (CSO) and building interethnic coalitions with key support from organized labor and the liberal left, Roybal was able to gain electoral control of the city's ninth district. Very popular, Roybal retained this post until his election to Congress in 1962. In a similar manner, increased voter registration, coalition building, and the support of organized labor were key elements in Villaraigosa's triumph. Both of these historical periods were prefaced by a social catalyst that fostered an upsurge in voter registration: the shock of the Zoot Suit riots galvanized the Mexican America community in a way that was conductive to Roybal's election. Similarly, Republican support of Proposition 187 in 1994 served to catalyze the Latino vote away from business-oriented candidates to liberal coalition builders who identify with organized labor." The book concludes with a chapter . . . on the evolution of the Latino political machine in L.A., including its recurring attempts to build coalitions across ethnic groups, labor, and the political left. 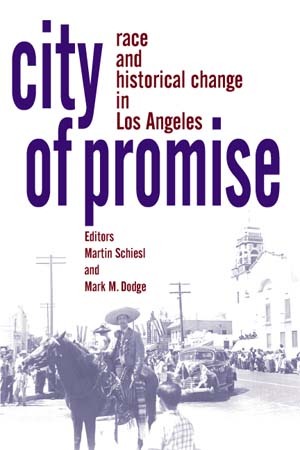 . . .City of Promise is a useful addition to the growing literature on Los Angeles, urban studies, and the U.S. West.